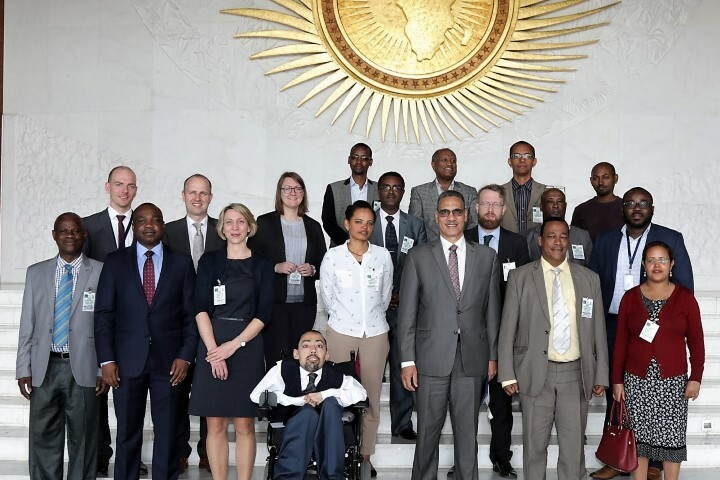 The Regional Geothermal Coordination Unit (RGCU) of the AUC arranged a high-level meeting with the a delegation of the Ethiopian Ministry of Water, Irrigation and Energy (MoWIE), Ethiopian Energy Authority (EEA) and Ethiopia Electric Power (EEP) on 14 March 2019 at the AUC HQ in Addis Ababa, Ethiopia, one day after the 16th GRMF Oversight Committee (OC) meeting. The Ministerial delegation was led by Dr Frehiwot Woldehanna, the State Minister of the Ministry of Water, Irrigation and Energy. Dr Frehiwot Woldehanna was joined by Directors, and other Representatives of the Directorate for Energy Study and Development, the Directorate for Climate Change and Environment, the Geothermal Resource Development License & Administration Directorate, the Legal Affairs Directorate, the Generation Construction Executive Office, and the IPP PPT Directorate. The representatives for GRMF included the members of the Oversight Committee (RGCU, KfW, DFID, Representative of eligible countries), as well as the Technical Consultant team. Both the Ministerial delegation, as well as the representatives of the GRMF Oversight committee appreciated the constructive information exchange, and agreed to continue the dialogue by various channels and on a regular base, in order to accelerate the development of the geothermal sector in Ethiopia. 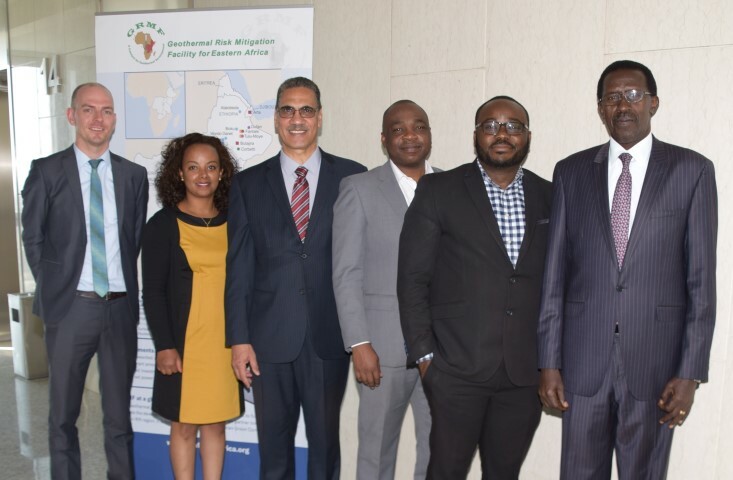 After five successful Application Rounds of the Geothermal Risk Mitigation Facility (GRMF) with 30 awarded projects, the Regional Geothermal Coordination Unit (RGCU) of the African Union Commission (AUC) would like to gather key facts of planned geothermal projects in Eastern Africa, in order to assess the market potential for a sixth Application Round. projects which have been rejected in the previous Applications Rounds. in one of the eleven eligible GRMF countries (see Figure 1). Please fill the survey form until 6 March 2019 on this external link. Feel free to contact the GRMF team via the website www.grmf-eastafrica.org. The survey will take approx. 10 minutes (depending on your internet connectivity). If the assessment for a sixth Application Round is positive, it will be announced on the GRMF website, and other channels. Furthermore, all stakeholders (including participants of this survey) as well as relevant media will be informed accordingly. Figure 1: Eligible countries of the Geothermal Risk Mitigation Facility. Note: All data as submitted by the participants will be kept confidential by the GRMF. Greetings from the GRMF team, which seizes the opportunity to wish you a prosperous and happy New Year! Following the appointment of Mr Rashid Ali Abdallah as the Director for African Energy Commission (AFREC) in Algiers, Algeria, we would like to inform you that Mr Atef Marzouk, the Acting Head of Energy Division within the Infrastructure and Energy Department, has been appointed as the Project Manager for GRMF effective on 26 November 2018. The Regional Geothermal Coordination Unit: Mr Matthias Klarl (Local Technical Consultant), Mrs Tsemre Esayas (Project Assistant), Mr Atef Marzouk (GRMF Project Manager), Mr Sylvain Degolmal Ngaryo (Principal Energy Expert), Mr Sahr Foday (Senior Procurement Officer), and Mr Philippe Niyongabo (Energy Expert). 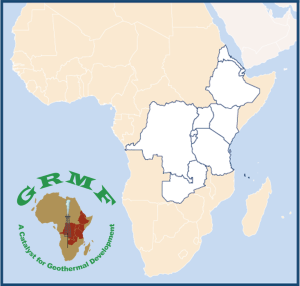 The GRMF will continue to support and work closely in order to expand the development of geothermal resources in East Africa. After approximately six years, and five application rounds of GRMF, the Oversight Committee (OC) wanted to get a direct and structured feedback of all developers that applied since the first application round. 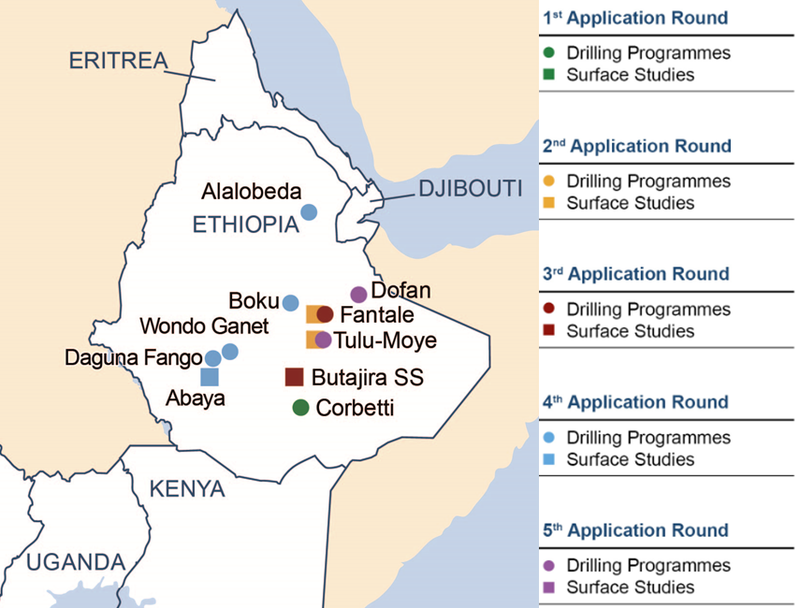 Therefore, in QII 2018 the Regional Geothermal Coordination Unit (RGCU) launched an online survey to 29 developers (10 public, and 19 private ones) that applied in total for 64 projects (27 drilling programs, and 36 surface studies) in eight different countries between 2013 and 2018, in the course of five application rounds. Out of the 64 applications, so far 30 projects have been awarded for GRMF grants. The objective of this survey was to get an insight into the market, as well as to detect barriers and obstacles which impede the development of geothermal power projects in the region. The inputs and answers of the developers should reveal their perception of GRMF, improve the performance of the program, and help to identify barriers for the development of the geothermal sector in East Africa. Next to the AUC (with its RGCU) and the donors to understand the particular markets, the report is addressed to project developers, ministries and authorities in the eligible countries, energy policy makers and advisors, as well as to development banks and agencies. The report shall compile and analyse the findings of the survey. The official version of the report can be downloaded here.